This assignment will allow you to use ArrayLists and explore “has-a” relationships between classes (as opposed to “is-a” or inheritance, more on that later). It will hopefully also give you some insight on how larger, graphics-based programs are designed and built. Your task will be to write a set of supporting classes for a simple shopping program. I’m providing the GUI code (Graphical User Interface) that will provide the “front end” to the program. You are to write the back end (what is often referred to as the “domain specific code”). In addition to the four methods you will be asked to submit a ShoppingTest.java file to show me how you thoroughly tested your Objects as you were developing them (*full details below, don’t miss this). Below is a screen shot of what the program could look like when the user has selected various items to order. Prices are expressed using doubles and quantities are expressed as simple integers (e.g., you can’t buy 2.345 of something). Notice that some of the items have a discount when you buy more. For example, silly putty normally costs $3.95 each, but you can buy 10 for $19.99. These items have, in effect, two prices: a single item price and a bulk item price for a bulk quantity. When computing the price for such an item, apply as many of the bulk quantity as you can and then use the single item price for any leftovers. 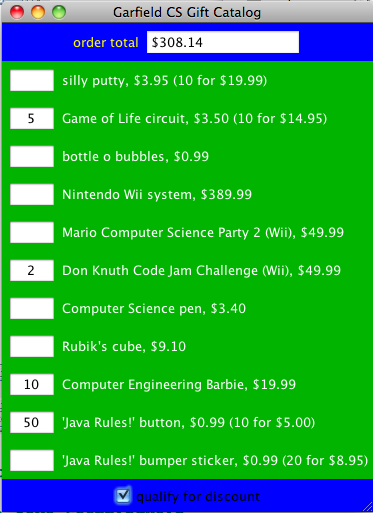 For example, the user is ordering 12 buttons that cost $0.99 each but can be bought in bulk 10 for $5.00. The first 10 are sold at that bulk price ($5.00) and the two extras are charged at the single item price ($0.99 each) for a total of $6.98. You are to implement four classes that are used to make this code work. You should implement a class called Item that will store information about the individual items. It should have the following public methods. Item(name, price) Constructor that takes a name and a price as arguments. The name will be a String and the price will be a double. Should throw an IllegalArgumentException if price is negative. Item(name, price, bulk quantity, bulk price) Constructor that takes a name and a single-item price and a bulk quantity and a bulk price as arguments. The name will be a String and the quantity will be an integer and the prices will be doubles. Should throw an IllegalArgumentException if any number is negative. priceFor(quantity) Returns the price for a given quantity of the item (taking into account bulk price, if applicable). Quantity will be an integer. Should throw an IllegalArgumentException if quantity is negative. toString() Returns a String representation of this item: name followed by a comma and space followed by price. If this has a bulk price, then you should append an extra space and a parenthesized description of the bulk pricing that has the bulk quantity, the word “for” and the bulk price. You should implement a class called Catalog that stores information about a collection of these items. It should have the following public methods. Catalog(name) Constructor that takes the name of this catalog as a parameter. The name will be a String. add(item) Adds an Item at the end of this list. size() Returns the number of items in this list. get(index) Returns the Item with the given index (0-based). getName() Returns the name of this catalog. You should implement a class called ItemOrder that stores information about a particular item and the quantity ordered for that item. It should have the following public methods. ItemOrder(item, quantity) Constructor that creates an item order for the given item and given quantity. The quantity will be an integer. getPrice() Returns the cost for this item order. getItem() Returns a reference to the item in this order – returns the item. You should implement a class called ShoppingCart that stores information about the overall order. It should have the following public methods. ShoppingCart() Constructor that creates an empty list of item orders. add(item order) Adds an item order to the list, replacing any previous order for this item with the new order. The parameter will be of type ItemOrder. setDiscount(value) Sets whether or not this order gets a discount (the value set to true means there is a discount, false means no discount). getTotal() Returns the total cost of the shopping cart. You are not to introduce any other public methods to these classes, although you can add your own private methods. You are allowed to redefine toString in any of these classes (you might find that helpful in testing and debugging your code). You should use an ArrayList to implement the ShoppingCart and Catalog classes. You will probably want to write your own testing code so that you can develop these classes in stages rather than all at once. When you have confidence that your classes are working, you should combine them with the GUI classes to make sure that they are working properly. Most of these methods are fairly simple to write, but notice that when you add an ItemOrder to a ShoppingCart, you have to deal with replacing any old order for the item. A user at one time might request 3 of some item and later change the request to 5 of that item. The order for 5 replaces the order for 3. The user isn’t requesting 8 of the item in making such a change. The add method might be passed an item order with a quantity of 0. This should behave just like the others, replacing any current order for this item or being added to the order list. This would set the variable text to “$38.50”. There are several potential errors that you are required to handle, as outlined above. If the client requests an illegal index for the catalog, the ArrayList you are using will throw an IndexOutOfBoundsException. This is the right thing to have happen, so you don’t have to introduce your own check for this case. You will be graded on program style including the use of good variable names, comments on each class and each method, using local variables when possible and other standard stuff. *Just as importantly you need to make sure that your ShoppingTest.java is thoroughly testing your Objects; it must create items for both bulk and non-bulk cases, assemble a catalog, create a shopping cart adding bulk and non-bulk items and verifying prices, also attempt to set discount to receive full points. Your classes should be stored in files called Item.java, Catalog.java, ItemOrder.java and ShoppingCart.java. You will need to include the files ShoppingFrame.java and ShoppingMain.java from the class web page in the same folder as your program to run the GUI. You should open and compile ShoppingMain to run the program.